The new-for-1962 MGB’s up-to-date envelope body shape was a product of its new monocoque construction as it was of contemporary style. This sports car’s low, wide nose, deeply scalloped headlamps and its 1,800cc engine’s need for 120 square inches of radiator cooling area called for a new interpretation of the traditional chrome-surround/vertical-slat grille that had graced all MG’s since it debuted on the PB Midget in 1935. The 1962-1964 MGB’s grille shell was chrome-plated brass matched with separate stainless-steel vertical slats, an it attached to the body with three riveted brackets. The were 18 slats per side, separated by a chrome-plated center bar that had a shield-shaped nose which held the plastic emblem with a chrome-ringed red MG octagon on a black field. A material change carried that grille on all MGBs and MGCs built from late 1964 thru 1969. British Leyland felt the MGB needed a facelift for 1970. The traditional chrome grille was replaced by a trendy black, deeply recessed affair that was actually inspired by the grille design of the 1968 Ford Mustang. 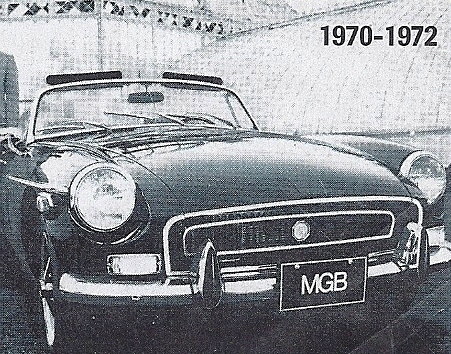 The final grille to be fitted to the chrome-bumper MGB in 1973 and early 1974 production was a brilliant move by a British Leyland executive in New Jersey. He suggested combining the pre-1970 grille surround with a black mesh insert. The 5 mph “rubber bumpers’ used from September 1974 to end of production in 1980 combined the front bumper and air inlet into one unit. While clever and traffic-friendly, this couldn’t compete with the original grilles in style or popularity.